South Korean goalkeeper Jo Hyeon-woo said Saturday he'll put his World Cup memories behind to only focus on winning an Asian Games gold medal. Jo is one of the 20 players who will represent South Korea at the Jakarta-Palembang Asian Games in Indonesia. South Korea are the defending champions at the Asian Games. 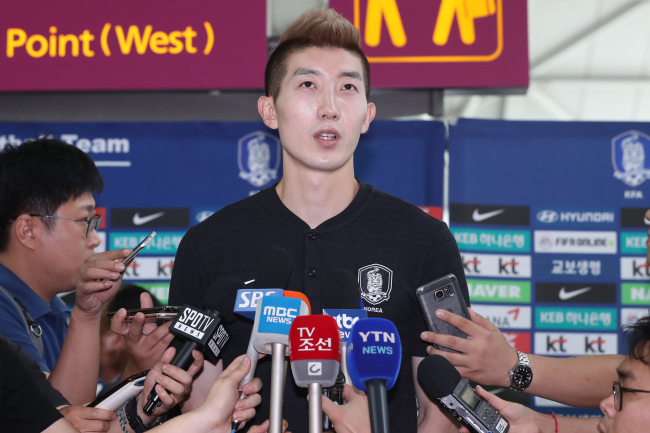 They are paired with Bahrain, Malaysia and Kyrgyzstan in Group E.
"Honestly, I have big expectations rather than concerns," Jo told reporters at Incheon International Airport before taking a flight to Jakarta. "We'll work hard to win the gold medal without conceding a single goal like the national team did at the 2014 Asian Games." Jo gained international stardom through the 2018 FIFA World Cup. The Daegu FC goalkeeper was the surprise starter for South Korea at the World Cup and was named the Man of the Match in the team's shocking 2-0 victory over Germany in the group stage. Though South Korea didn't get past the group stage, Jo was one of the few bright spots for the team. Jo, however, said he has put the 2018 World Cup experience in the past. "I want to focus on the Asian Games instead of thinking about the past," he said. The men's football competition at the Asiad is open to those 23 or younger, but teams can field up to three players who are older. Jo, 26, is one of the three "wild cards," along with Tottenham Hotspur star Son Heung-min and Gamba Osaka striker Hwang Ui-jo. "Head coach Kim Hak-bum told me to work harder and lead others by example," he said. "Not only myself, but the other two wild-card members, Son and Hwang, will make big contributions toward this team winning the gold." Jo said he recently spoke with Son about the Asian Games. The Tottenham forward will join the team Monday after playing in his club's Premier League opener against Newcastle on Saturday. "Son told me he just wants to score lots of goals," he said. "Our teamwork will improve with Son's addition, and we want to show our performance as a team."